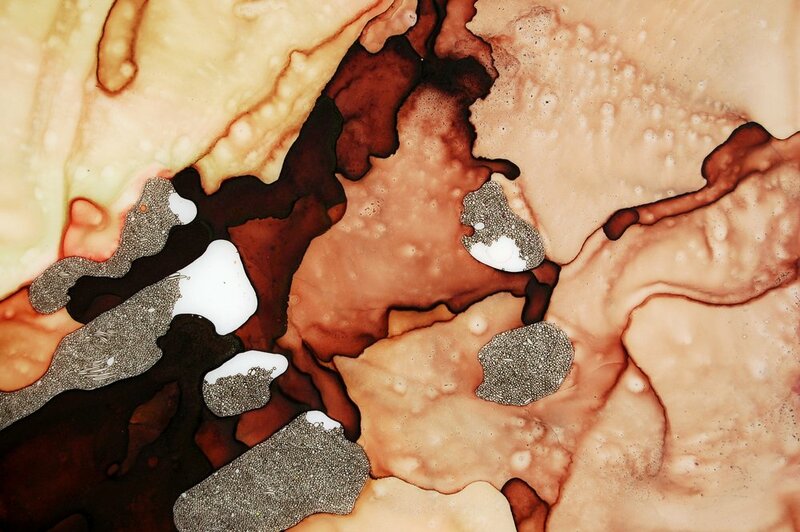 Pools of water, raw pigment and ink are poured onto the flat Mylar surface. As these pools intermingle, a struggle ensues between myself, the medium and gravity. More than once, I have discovered most of the liquid has seeped onto the floor. Over the course of several days, the puddles and colors are manipulated, always allowing for the element of surprise. Once the pigments dry, I draw hundreds of tiny circles and shapes onto the Mylar, as if it is infested with tiny ink globules. Bold color, intricate drawing, and a central square form are made to play off one another. The translucent quality of the pigments and the Mylar result in a Painting in Space. As I was building the room-sized sculptural installations, Paintings in Space - Rooms, I was also working in two dimensions on paper. 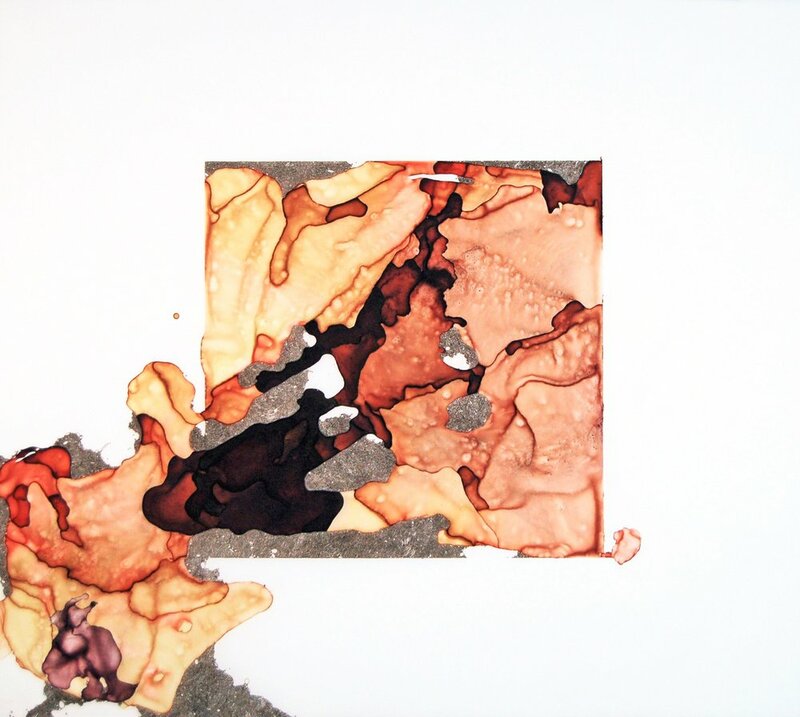 Using the same raw pigments, inks and paints that I use in the installations, I began to make paintings on Mylar. Mylar is a translucent “paper” that allows me to continue exploring the dimensional qualities of a painting. Available at Buy Some Damn Art. The Ocean as a painting medium. Each piece is made using water from the sea and other natural sources. I like the idea of using nature’s materials as part of the painting. I am always amazed at the colors and shapes that reveal themselves in the drying process. Though I manipulate the painting while it is drying, it always seems to have a mind of its own. More than once, I have discovered most of the liquid has seeped onto the floor creating a pattern of flow on the paper. I respect the unruliness of these pools of pigment and love the challenge of collaborating with the flow of water. 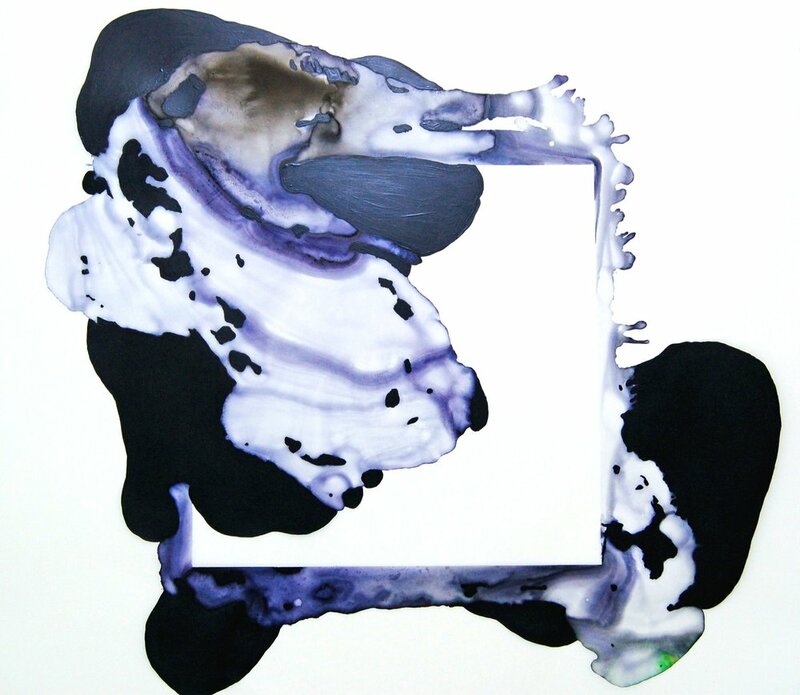 For these Paintings on Mylar, I combine flowing pools of pigment and paint with methodical drawing. I love merging together the contrasting elements of chance and intent. Once the paint dries, I begin to draw on the work. Aiming for the tiniest shapes possible, I work obsessively building an overall form from hundreds (thousands?) of teeny tiny circles and squiggles. I am always trying to capture the feeling one gets when surrounded by nature in an environment completely untouched by humans. The light captured in this place. The layers of shadows and shapes piled on top of each other. The total and complete immersion that occurs there. There is something so magical and trans-formative about these spaces in nature. Something I want to capture again and again. An inner central square is where most of the painting occurs in these works. I love juxtaposing a square shape within a rectangular piece of paper. It allows me to bring into the work that human inclination for order and symmetry. I obsess over city urban trees and how their roots explode out of the allotted squares they were originally confined to. Each one makes it’s own unique shape, sometimes carrying a brick or piece of metal along with it as it grows. Or when you fly over vast Midwestern farmlands, neatly organized into grid formats. I always look for the cracks and crevices between property lines where nature has embedded itself, rumpling the edges. Click through the images to see the details of this work and its influences. Click on the images to see the work and where to purchase. Unframed and floating away from the wall. Using small magnets and nails to hang away from the wall. Magnets and nails are used to suspend work away from the wall.